​As Madison Mayor Paul Soglin and other Wisconsin leaders lobby in Washington, D.C. for Congress to pass the Dream Act of 2017, local students and leaders met at Centro Hispano Wednesday to advocate for comprehensive immigration reform. ​This year, the farmers' market at Centro Hispano is stepping up its game. Centro Hispano has been hosting farmers' markets for a while (including a winter market), but this year, the first market of every month will be amped up with activities to encourage community and provide a platform for health education. 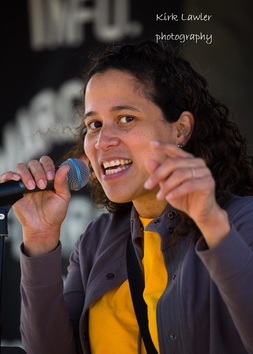 ​Karen Menendez Coller, executive director of Madison’s Centro Hispano, has been named the inaugural recipient of Forward Community Investments (FCI) “March for Justice” Award made in memory of Nan Cheney, a passionate social justice activist. The current political climate has made things difficult for immigrant communities and organizations that serve these communities. Learn Read about Centro Hispano and how excited they are to be the recipient of the 2017 charity makeover. Laura Minero learned multiplication from the back of a Ritz cracker box when she was in first grade. “My mom wrote the times tables out by hand, 1 through 9, so I could learn them,” Minero said. With just a sixth-grade education, Minero’s mother was motivated to not just teach her daughter math, but also bring her along as she illegally entered the United States from Mexico to rejoin her husband. ​Madison365: What is your favorite place for thinking? 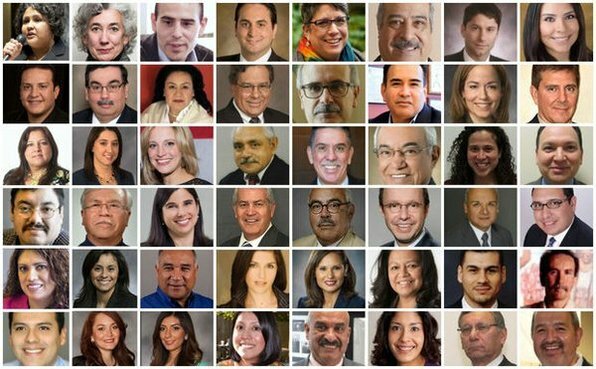 The 48 most powerful Latinos in Wisconsin, by the Wisconsin State Journal. Madison will be pondering that today as thousands of Wisconsin Latinos will be leaving school, work and businesses to come to the state Capitol building to protest two pieces of anti-immigration legislation that the Wisconsin State Legislature is trying to push through. Several area businesses will be closed today for "Día Sin Latinos (Day Without Latinos)" to demonstrate what the community would be like without Latinos and immigrants. 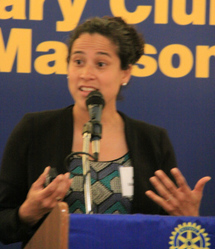 "If all the Latinos that were working in Dane County were to walk out, it would be huge – especially here on the south side and on Park Street," Centro Hispano Executive Director Karen Menendez Coller tells Madison365. "So many of the employees that are hired by local businesses are Latino, so services would drop in so many ways. We are such a growing population here that consumerism would be affected. If the kids walk out, you will definitely see it at the schools. It will be a large void that is felt." Centro Hispano works to improve the quality of life for Latinos and others living in Dane County by empowering youth, strengthening families and engaging the community. Recently, Centro has been ground zero for people coming together to network and to organize. "A little while back, Christine Neumann-Ortiz, executive director of Voces de la Frontera, had an interest in creating a Voces chapter here in Madison," Menendez Coller says. "That was something where we could see a gap, and we thought was necessary for what we do. We needed to have a coordinating force." 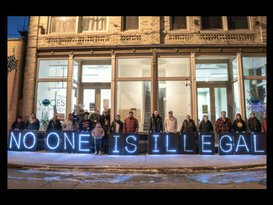 Based out of Milwaukee, Voces de la Frontera is Wisconsin's leading grassroots immigrant rights group. They have been working with Centro to create a space in Madison where important discussions can happen. This past Saturday, Centro was host to over 300 people who gathered to talk about plans for the day of action on Thursday. "It's exciting because I feel for the first time I'm seeing families take ownership of these issues," Menendez Coller says. "They've had enough, and they are just going to do something about it." There are two anti-immigration bills going through the Wisconsin State Legislature that are helping to energize the movement. The first bill prohibits towns and counties from issuing or expending funds for the issuance of a photo identification card for any resident of the town or county other than an employment-related identification card for employees of the town or county. The second bill prohibits "sanctuary cities" and bars local governments from adopting ordinances that prevent police or other local officials from asking crime suspects about immigration status. Menendez Coller does not understand where the rush of legislation is coming from or why it is suddenly needed. "Day-to-day, I see families. I see people working two or three jobs to give their children a better life. The exclusion is hard for me to watch," she says. "The two things that promote equity – employment and education – well, we won't give you a driver's license so you can't drive to any type of work and the kids can't go to college because we're not going to allow them to do that. It's just an unwelcoming feeling, and it affects so many in our community. It sends a message that we just don't see these individuals as equals. We can't treat them the same. "They don't understand. People don't know the numbers, they don't know the background in those communities, they don't know the issues that are involved," she adds. "There is a big fear that has been created and unfortunately it's been simplified to criminals equal Latinos or danger equals immigrants." According to a recent University of Wisconsin-Madison study, immigrants account for more than 40 percent of the hired help on dairy farms. They make up a big part of Madison-area businesses including construction, hotel, manufacturing, restaurants and grocery stores. Many of these Madison-area businesses will be closed today including several of the Latino Chamber of Commerce of Dane County's member businesses. "The Latino Chamber of Commerce of Dane County is opposed to these anti-immigrant bills as they would significantly impact our local economy," says LCC President Mayra Medrano. "Latinos make a significant contribution to our community and are very involved in entrepreneurship here. We want to support them. "Latinos and immigrant workers contribute to the Wisconsin economy on a daily basis," she adds. "Latinos and immigrants live in Wisconsin and in this country, because they too want to be part of the American Dream." Organizers of "A Day without Latinos and Immigrants" called for people to assemble at the at the State Street entrance of the state Capitol at 10 a.m today. High school students in Madison and other cities are planning to walk out of class and march or board buses to the Capitol. Buses will be leaving from Centro on Madison's south side to go up to the Capitol. "I hope that there will be a lot of people who aren't Latino at the rally today – white people, African American [people]," Menendez Coller says. "I hope that there will be a huge number of Latinos, but I also hope that this is the first step in the entire city seeing this as something that we need to rally around and that this is not just something that is our issue, but affects the whole community." What Are We Doing To Support Latinos In Madison? ​The questions come up all too often: How many undocumented persons are in Madison? How many undocumented clients does Centro Hispano serve? Were you documented when you came to this country? When speaking of Latinos, we are overly fixated on legal status. It is true that being undocumented leaves you in the shadows without access to basic rights and strips you of your dignity as a human being. But even despite documentation, our health and well-being continue to worsen the longer we are here in this country. I often reflect on why I speak out for the rights of our Latino community. I was born in El Salvador and didn’t really establish roots in this country until I was a teenager. After living here for close to 30 years, this has become my home country. It is an injustice to deny that identity to me or to so many others who came here searching for stability, freedom and a future that politics in our countries of origin stole from us. We deserve to feel comfortable here. As a Latina, I represent the fastest-growing minority group in Madison, Dane County and Wisconsin. We are the second-largest ethnic group behind non-Hispanic Whites in this country. We are much of the labor force driving the economy, as well as the millennials generating new initiatives and innovative ideas across many cities. Why are our rights something we have to fight for so vehemently? Why is this country so afraid of differences, and why do we continue to put people into buckets that divide us and lessen our “American-ness”? We are not “aliens” or “illegals.” Nor are we dangerous. Words matter, so choose them wisely. We are human beings, striving for the best life possible, just like everyone else. Decades of civil war and community unrest have torn apart our dreams in our home countries. Like all people, we are not perfect, but it is unjust to expect us to be more perfect than anyone else, especially given the barriers we seek to overcome. How many undocumented persons are in Madison? That is the wrong question. Ask instead: What we are doing to support Latinos in Madison? In 2016, let us be reflective, ask the right questions and recognize that the current anti-immigrant policy rhetoric is wrong. Building walls, promoting blind deportations, and discriminatively closing borders is unnecessary and immoral. It is unjust, and it takes our country backwards. Immigrant children deserve the best education and the chance to aspire to reach dreams set forth by their families — so many of whom have sacrificed everything to be here. We need to create a system that will empower our Latino community, driven by a commitment from businesses, non-profits and the community-at-large. If we don’t, as a country we will falter. ​The men and women heading up local businesses, nonprofits, schools and government are younger, more diverse and more creatively collaborative than ever before. And they’re just getting started. A little more than sixteen years ago, the cover of Madison Magazine featured a group of Madison leaders including the mayor, fire chief, Dane County executive and district attorney, presidents of Madison Area Technical College and the University of Wisconsin System and others in positions of prominence. All were women. Every one. It was a vivid and powerful image of a historic, cultural change. Here we go again. Madison leadership is going through a transformation as significant as the gender-dominated change of the late ’90s, only this one is far more diverse and reaches deeper into the civic structure. The image on this month’s cover is equally powerful and meaningful. The new face of leadership in Madison is younger, more colorful and more diverse by a much broader definition of diversity. Its impact on our community is already being felt in very important ways, and yet there is a clear sense of having just scratched the surface of what is possible. Make that what is probable. Change is here. More change is coming. New leaders are emerging throughout Madison’s business, nonprofit, education and government sectors. While many positions of power, including police and fire chiefs, the head of the Urban League, county executive and, of course, Madison mayor, are held by, shall we say, more seasoned professionals, those same institutions also include young folks with important jobs, and many of them have relationships with the New City Leadership we’ve identified here. The problem with starting such a list is ending it. It necessarily includes people for the positions they hold and/or the institutions they represent. Everett Mitchell, who recently announced his candidacy for a Dane County Circuit Court seat, is a community leader in a growing number of ways, but as director of community relations is also an important representative of new leadership at the University of Wisconsin–Madison. Likewise, Amy Gannon at Edgewood College, Sandy Morales at Big Brothers Big Sisters, Kevin Little at the Chamber of Commerce and Brennan Nardi at the Madison Community Foundation all combine personal and institutional leadership roles. Madison East principal Michael Hernandez is an example of the dynamic young talent superintendent Jennifer Cheatham is putting in leadership positions within the Madison Metropolitan School District even as Cheatham herself assumes a major leadership role with her vision for our schools and our community. Brandi Grayson is a new Madison leader who really emerged in the past year, giving a powerful voice to a new generation through her work with the Young, Gifted and Black Coalition. Others straddle the admittedly arbitrary dividing line of age and title and are already respected civic leaders, like Michael Johnson at the Boys & Girls Club, Henry Sanders at Madison365 and Annette Miller at MGE. The eleven people featured in this story are therefore examples of a wider new leadership paradigm as much as they are singular leaders. However, collectively they represent something much greater. Put them in a room together and one realizes Madison has changed, profoundly and permanently. Perhaps a half a century of civic leadership has turned over, names that are or will be on buildings, schools and walls of honor. They have been succeeded by a new generation of leaders with new ideas, new values and new ways of leading. And the sheer breadth of this group is quite amazing. Think about it: Madison schools, the Chamber of Commerce, United Way, Centro Hispano, the Madison Community Foundation, the Madison Common Council—some of Madison’s most important, influential and powerful institutions, all with new leaders. All are keenly aware of the issues we face together and they bring a fresh perspective and approach to those issues. All are fluent in cultural diversity, social justice, equity in opportunity, achievement and reward. All share a comfort with disruption, risk and change. Madison Community Foundation president Bob Sorge is the oldest at forty-eight. Twenty-nine-year-old StartingBlock executive director Scott Resnick is the youngest. Madison alder Maurice Cheeks is thirty-one, United Way of Dane County president and CEO Renee Moe is thirty-nine. Centro Hispano executive director Karen Menéndez Coller is forty, Urban League of Greater Madison board of directors chair Nia Enemuoh-Trammell is forty-three, Madison schools superintendent Jennifer Cheatham is forty-four, as is University Research Park managing director Aaron Olver. Alder Shiva Bidar-Sielaff is forty-six and YWCA Madison CEO Rachel Krinsky is forty-seven. Not a Baby Boomer in the bunch. The New Face of Madison Leadership is a generational blend of Gen Xers and Millennials. We need to understand that. In 2016—this year—Millennials, people born after 1980, will become the largest American generation. The significance of that looms large for Maurice Cheeks. The bridge is built on a foundation made up of values that every one of these new leaders expresses in one form or another sincerely, comfortably, seemingly effortlessly. Diversity, risk, collaboration created with a comfort in disagreeing and a deliberate checking of egos at the door. So the journey to this place, to Madison and to leadership, is another example of diversity, and it also influences one’s perspective on what it means to lead. Through different paths and with different perspectives, these new leaders are ultimately creating better support and a stronger community. Brandon says “almost unintentionally,” this group builds off each other’s thought leadership. These new leaders have worked and continue to work with each other in different groupings, in part because of past relationships and in part because of current jobs. Brandon was an alder. He and Olver worked together at the Wisconsin Department of Commerce. Enemuoh-Trammel is on the Madison Police and Fire Commission. 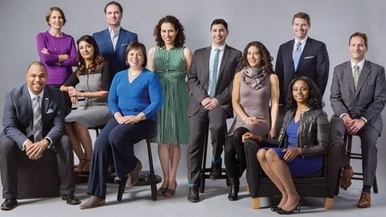 Resnick co-owns a successful tech business and is a former alder (and mayoral candidate, the first out of a sub-group of qualified candidates in this group of eleven). Moe has been with United Way for what feels like forever, and thus knows everybody. Menéndez works closely with Cheatham. Cheatham does the same with Brandon and Sorge. Cheeks just took a new gig at the Madison office of the global technology company MIOSoft. You get the picture. These folks are connected to the community, to sectors of interest and influence and to each other. “It goes back to wanting to really have relationships, meaningful relationships and really good conversations and a sense of approaching challenges together,” says Madison alder and UW Health director of community partnerships Bidar-Sielaff. Menéndez Coller sums it up: “We work very well together,” she says. “It’s funny, I’m never drawing color lines with them. We’re almost generationally at that point, and the reason I feel I get along with Jen [Cheatham] is because we see the world the same way. I was told one time that everybody sees the world in a different way, but I feel like with this group of people, we all see it the same way. So there are some understood values that we all have, and then, okay, what do we do next? We’re ready to take the next step." So, what does come next? If this next generation leadership change means anything, it means change begets more change. After several decades—a generation—“how good we are” and “how good we’ve been” have been exposed in various ways. That sentiment is an example of a community resting on its laurels to the point of calcification. It is an excuse for not seeking and eventually embracing new ideas and for shunning risk. And, perhaps most importantly, it is not shared. Criticizing any individual is neither useful nor necessary. But there is a connection between an over-appreciation for the good old days and the sense of surprise, if not disbelief, that Madison has some of the worst racial disparities in the country. These new leaders praise their predecessors and express admiration for their contributions, while at the same time recognize the value of, and need for, change. Create something. These are perhaps the two words most descriptive of the vision, explicit or implicit, of Madison’s new leaders. The history of Madison is built on appreciation of the many shoulders upon which we all stand that feels unique even in a country that has mythologized its forbearers. Doty begat Nolen, who begat Frautschi, who begat Nelson, who begat Soglin. The New Leaders of 2016 are respectful of these self-made, white men who built—yes, let’s get it over with—the Best City to Live in America. But we were getting perilously close to caricature, the civic equivalent of the movieGroundhog Day, stuck in the ’60s, with fifteen-minute commutes, unlimited job openings at Oscar Mayer and in state government and plenty of parking. Like many more self-aware cities, Madison is now viewing its future through the lenses of innovation, diversity, creativity, globalism and change. Our physical landscape is beginning to reflect that future. And, now, our leadership is as well. ​Once again, children will be forming a line to sit on the laps and get a regalo from Melchor, Gaspar, and Baltasar at Centro Hispano’s annual Tres Reyes Magos (Three Kings’ Day) celebration Jan. 8 at Centro on Madison’s south side. A young person enjoys his regalo at a previous Tres Reyes Magos celebration at Centro. According to Latino tradition, children receive presents on Jan. 6, “el día de Reyes,” the Day of the Kings, or the Wise Men. It is the Magi who brought the presents to the Baby Jesus, and tradition has it that they bring toys to the boys and girls who have been good. Centro traditionally hosts its Tres Reyes Magos celebration on the Friday closest to Jan. 6. In many Hispanic countries, ‘El Dia de Reyes'(Three Kings Day) represents the height of the Christmas season and is the day when people exchange gifts, rather than on Dec. 25. The Tres Reyes Magos tradition is important for Latinos throughout the world and a magical event for children. Sal Carranza, Al Felice, and Baltazar de Anda will once again be back to play the part of kings at the annual Tres Reyes Magos event. The annual Tres Reyes Magos celebration will be held Jan. 8, 4-7 p.m. at Centro Hispano, 810 W. Badger Rd. All are welcome. By Lisa Speckhard | Thu, 11/12/2015 - 10:42amIn a room with brightly painted murals of Hispanic heroes, a group of refugees from Bhutan, armed with No. 2 pencils and an eagerness to converse, sits down to begin English class. All are there to learn, and the air crackled with mental effort. The one exception was a pupil who sat playing with a scarf and singing a multi-lingual version of “Happy Birthday” to herself, which started in English and gradually tumbled into her native tongue. This refugee was Trishna, and she isn’t more than 3 years old. Trishna is the granddaughter of one of the students, and she was there to play. As a child, it is her right to be oblivious to what is going on in the refugees’ world. The Syrian refugee crisis has shifted the national spotlight to U.S. refugee policies making it harder for Madison residents to have the same attitude. The United States has raised the national cap on refugees from 70,000 this year to 85,000 in 2016 and 100,000 in 2017. This national issue has local impact: Madison received 47 refugees in 2015. Gregg Williard, the ESL Group Instructor and Refugee Program Manager, had two volunteers to help him work around the small room and offer assistance to his eager students. At the beginner table sat Pabi. Outfitted in a purple sweater, green vest and blue Hawaiian print skirt, she set out to conquer her workbook. Pabi, like most others in the room, is Lhotshampa. The Lhotshampa are traditionally Hindu and speak Nepali, making them an ethnic, linguistic and religious minority in Buddhist Bhutan. In the 1980s, the Bhutanese government began a campaign for “One Country, One People” – and the Lhotshampa did not fit into that definition of “one.” They protested, and the government violently retaliated. They fled, and after waiting in Nepal for 20 years hoping to return home, many Lhotshampa began resettling in the US in 2008. Pabi arrived in the U.S. in 2012 and is focused on the next phase of her life: mastering English. She can express a lot with her face, tone and few English words, including the international practice of bragging about one’s children. “All married,” she said happily. She has 10 grandchildren, but family reunions are overcast by the knowledge that a brother and sister are still overseas. While enthusiastic to communicate, Pabi was very aware of the logistical limits of her current grasp on English. “Hospital no English, doctor – hard!” she said. The room was filled with a lot of honest tries. Slowly spoken English questions and answers were punctuated with quick Nepali translations. This cheerful room presented a hopeful picture of refugee resettlement, but in 2012 the Center for Disease Control and Prevention found elevated suicide rates among Bhutanese refugees in the U.S. Almost 20 percent exhibited symptoms of depression and anxiety. The study cited language barriers, the inability to provide for family and stress about family still in their home country as causes. Once in America, refugees must mourn the loss of their own culture while jumping into a new culture crash-course. Mary Flynn is the Program Manager of Refugee Resettlement at Lutheran Social Services of Wisconsin and Upper Michigan. The program is one of several that partners with the state of Wisconsin to provide case management and job placement for incoming refugees. It also coordinates volunteer “sponsors,” who can take on a variety of roles from locating furniture for new refugee families to checking in on that family once a week for the first three months. For example, she said, refugees often need help sorting their mail, as they tend to throw out bills and save the Publishers Clearing House newsletter. The Literacy Network also depends on volunteers like the ones in Pabi’s class, who have their hands full helping five or six students fill out their workbooks. Lutheran Social Services and The Literacy Network rely on volunteers, and increased quotas will likely mean increased need. “It’s not enough that we bring people here. Are they going to be here and are they going to be okay?” Flynn asked. El Ejecutivo del Condado de Dane, Joe Parisi, y la Directora Ejecutiva de Centro Hispano, Karen Menéndez Coller (izquierda), destacaron la importancia de Fiesta Hispana para la comunidad del condado de Dane. Asimismo, Coller enfatizó que éste es el evento de la comunidad. 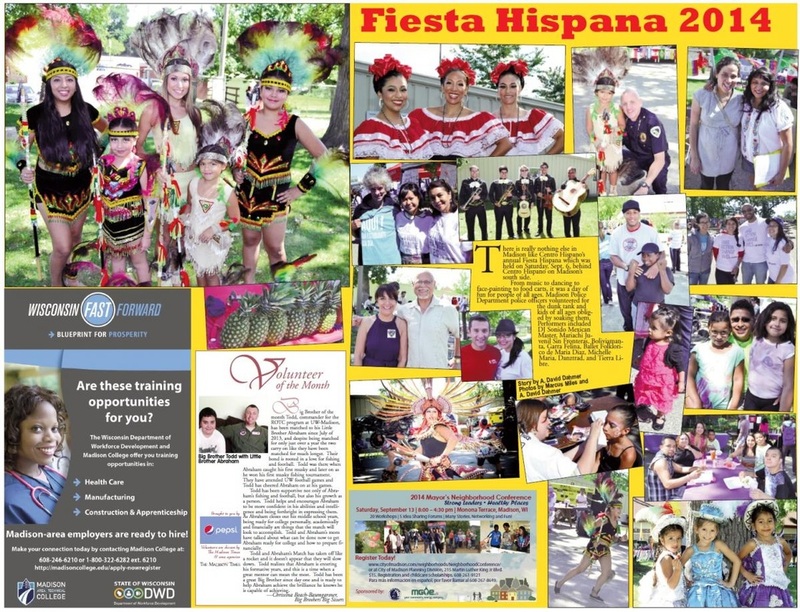 Fiesta Hispana es un evento cultural y familiar gratuito y está abierto a todo el mundo. Para obtener más información acerca de Centro Hispano, visite la página web aqui. Much of one’s culture is held within food traditions. The ingredients, methods and words that go into creating a dish teach and remind us of our heritage. Centro Hispano in South Madison has built many of its programs around the idea that food— growing, preparing and eating it—forges a direct connection to and preserves generational knowledge and cultural pride. In its second year, Centro Hispano’s farmers market, El Mercadito de Centro, has become a hub for South Madison’s Latino community, providing a place for residents to not only purchase high quality, farm-fresh food in an area of the city that does not have easy access to supermarkets, but also to have fun and learn. This year, the market will offer cooking demonstrations in Spanish and English by aspiring chef Ana Brito, and the demo dishes “will be full of Latin flavors and stories,” says Mariela Quesada Centeno, director of adult programs at Centro Hispano. As an extra bonus to get fresh produce onto the tables of families, El Mercadito de Centro participates in Madison’s Double Your Dollars program, which matches SNAP transactions made at participating farmers markets, and Centro Hispano has developed a cookbook featuring cross-cultural recipes and ingredients. 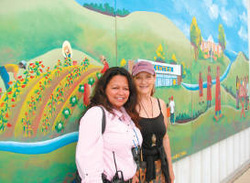 Centro Hispano also operates a community garden and hosts workshops taught by fellow community members. “We want to start planting cultural seeds with the hope that we will harvest stories, knowledge, empowerment, and of course, decadent recipes,” says Mariela. El Mercadito de Centro will be open weekly on Tuesdays, 9:00 a.m. to 1:00 p.m., from June through October at Centro Hispano, 810 West Badger Road, Madison. Wendy Allen was born and raised in the cornfields of Iowa, and after multiple attempts to escape to other parts of the world, she found herself pulled back to the black Midwestern earth of her roots. She now calls the Driftless region of Southwest Wisconsin home, where she found a passion for organic food and discovered that fields can be filled with things other than corn. Still the wandering soul, she travels far and often, and has come to know that the most meaningful art is nestled in the places one calls home. Sujhey Beisser has been elected the president of the board of directors for Centro Hispano of Dane County which works to improve the quality of life for Latinos and others living in Dane County by empowering youth, strengthening families, and engaging the community. A native of Venezuela, Beisser first started on the Centro Hispano board of directors in April of 2008. She has served as treasurer of the board for two different terms and has also served as secretary. Beisser was a member of the Executive Committee during the hiring process of the executive director two different times including the hiring of current Executive Director Karen Menendez Coller in August of 2013. Beisser has been a member of Centro Hispano’s membership committee for 5 years and chairperson of the scholarship committee for 4 years. Along with Brenda Gonzalez and Tania Ibarra, Beisser started the silent auction at Centro Hispano Annual Banquet in 2010 that has raised thousands of dollars for Centro’s programs over the years. By day, Beisser is the Branch Manager for Park Bank in Sun Prairie, the creator of and writer for Five Senses Palate, and the mother of two. As president of the board of directors of Centro Hispano, she takes over the reins from Interim President A. David Dahmer. HAS MADISON'S FOCUS ON BLACKS PUSHED LATINOS TO THE SHADOWS? Two years ago this month, Karen Menendez Coller left Los Angeles for Madison with her husband, a pediatrician who was bound for American Family Children’s Hospital. 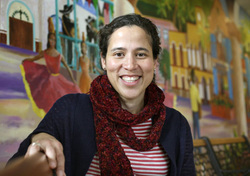 Two months later, she unexpectedly became executive director of Centro Hispano of Dane County. Coller, who is 40, left war-torn El Salvador with her family at age 14 and grew up in a predominately Latino neighborhood of Los Angeles. She eventually earned a Ph.D. from Johns Hopkins University in public health. Most recently she was a faculty member at UCLA. She came to Madison intending to work at the University of Wisconsin, but the prospect of doing hands-on work in the Latino community at Centro Hispano was too compelling. I gleaned from a lengthy interview and by hearing her speak to groups twice recently that she believes the city’s dominant white majority suspects — falsely — that many Latinos are undocumented and that they struggle with English. They are also seen as hard-working, making economic progress and having strong family values. In general, Latinos are not seen as being in crisis, which Coller said is not necessarily the case. “Centro,” as it’s called, is a nonprofit agency based in south Madison that provides social services and job training, and also serves as a cultural center for Latinos and other immigrants. Its storefront headquarters is just west of Park Street and north of the Beltline, about a five-minute walk from Fountain of Life Covenant Church, home of the Rev. Alex Gee and his heavily publicized Justified Anger movement. That geographic link tees up this question: Has the strong focus on African-American issues growing from disparities measured in the “Race to Equity” report and the intensity of the Justified Anger grassroots movement diminished public attention on challenges facing Latinos? She added: “There are complexities that tie our community and the African-American community together, and you realize that we’re all in crisis, really. … We are so small here in Madison, but you really see segregation, separation by poverty, by opportunity, by health. The south side is really suffering. The nearly two-year media and community focus on African-American issues in Madison seems defensible on merit, but one wonders if the very bright spotlight has contributed to the “shadow” to which Coller refers. Is it indeed a zero-sum game, a one-crisis-at-a-time sort of thing? In the past two years, the Cap Times — and I personally — have been intermittently criticized for inadequately writing about non-black minority communities, principally the Latino community. My defense, such as it is, is to point to the glaring disparity metrics afflicting the black community coupled with the blossoming grassroots African-American movement of civic leaders and everyday citizens. Now the major fundraising effort by Justified Anger — fueled by a $150,000 gift from our philanthropic arm, the Evjue Foundation — is fully under way on the heels of a huge kickoff event at the Alliant Energy Center two weeks ago. So perhaps it is time to step back and broaden the focus. A week after Justified Anger’s big blowout, I listened with a much smaller audience as Coller and her staffers told funders and Centro board members about the agency’s programs over a buffet dinner at Centro headquarters. In that presentation and another at Downtown Rotary, Coller pointed to a nearly 80-percent growth of Wisconsin’s Latino population between 2000 and 2010, and a 101-percent increase in Dane County during the same period. Nearly two-thirds of Latinos in Wisconsin were born in the United States and 83 percent speak English only or at least speak English “well or very well,” she said. The Latino unemployment rate is low, she said, but their incomes are also low. So, I ask her in the interview, what would you like white Madisonians to think about and do to help Latinos? Look for ways to get involved, she said, visit Centro, meet the kids, attend their festivals and enjoy their culture. She added, “So that people aren’t seeing us just because of the issues that we have, but because of the assets that we lend. I think if we try to take a step back and just see each other as part of a greater community, I think we would really come to a good understanding about who we are, what our differences are, and how we can become more of an equitable society. As she spoke, I wondered, how is this recurrent theme of racial and ethnic separation and isolation so prominent in such a generous and, at least outwardly, open-minded city? That’s a riddle worth pondering. Closing the achievement gap is an often talked about goal in the Sun Prairie Area School District, and the Schools of Hope AmeriCorps project is offering a means for community volunteers to help. Schools of Hope is a tutoring program C.H. Bird, Creekside, Northside and Westside elementary schools have been using since 2005 in an effort to offer one-on-one math and literacy help for struggling students. She is one of two AmeriCorps tutor coordinators working with the Sun Prairie elementary schools. United Way of Dane County and Centro Hispano of Dane County also partner to make the program possible. Each tutoring session is about half an hour long, and volunteers can help out for that time, or longer – whatever fits with their schedule, Lowry said. To become a tutor, those interested can apply on Schools of Hope’s website. Applicants will be asked to sign a disclosure form, which will allow for a background check. After that, a tutor coordinator will be contacted, who will talk to potential volunteers about their interest and skill set. After that, volunteers will be asked to complete a training. One training session from 5-7 p.m. on Wednesday, Oct. 22 at Creekside Elementary School. After that, Lowry and Sun Prairie’s other tutor coordinator, Rebekkah Rubin, can offer advice and resources for volunteers if needed. Schools of Hope is also present in Prairie View Middle School and Cardinal Heights Upper Middle School. This math and literacy tutoring program is directed by Urban League of Greater Madison. For more information, visit schoolsofhope.org. 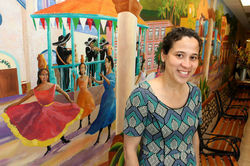 The story painted within a vibrant mural outside of the Centro Hispano building at 810 W. Badger Road is a familiar one to many members of Madison’s Latino community. It is a story of immigration, of migrant workers on Wisconsin farms, of adapting to a new community and setting a path for a better life. 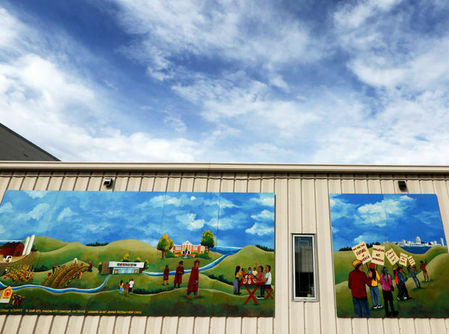 The mural, titled “Story of Immigration” and installed in June 2013, shows migrant workers on Wisconsin farms tending fields and hauling produce to a canning factory. Farther down the painted path, a family is seen seeking out Centro Hispano for help adjusting to new customs, a new language and a new environment. The story continues with images of a family celebrating with new college graduates. Most importantly, the mural tells the story of how one generation endured hardship and difficulty so their children might pursue a better life. Created in 1983 by a group of community volunteers, Centro Hispano is dedicated to assisting families with education, jobs and youth programs, while serving as a resource for the Latino community. As Madison’s Latino population has grown, adding to the richness of the cultural fabric of the community, Centro Hispano has expanded along with it. At the end of the mural is a quote from Cesar Chavez emphasizing giving back and investing in the community. Last week, Madison Mayor Paul Soglin confirmed that the Federal Emergency Management Agency had contacted the City of Madison about finding a place to temporarily house 150 to 250 unaccompanied children emigrating from Central America. Officials in Milwaukee were also contacted. The request is part of a national effort to cope with an estimated 90,000 child refugees from El Salvador, Honduras and Guatemala attempting to enter the United States from Mexico. Centro Hispano, a Madison-area nonprofit and advocacy group for Latinos in Dane County, has been assisting the City of Madison to help find a site in response to the federal government’s request. Centro Hispano’s Executive Director, Karen Menendez Coller, joined Monday Buzz host Brian Standing in the studio. A first-of-its-kind job fair with a focus on employment and career opportunities for Dane County's Latino population will be held Saturday. 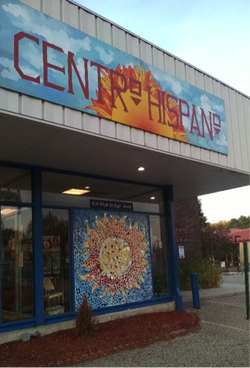 Centro Hispano, a Madison-based outreach group serving the county's Latino residents and families, will host the fair at it's center at 810 W. Badger Road with a kick off at 10 a.m. with Director Karen Menendez Coller and Dane County Executive Joe Parisi. Fifty area employers and educational providers including UW Hospitals, Epic and Madison College will take part in the fair, which will also include music, food vendors and activities for children. Employers looking to diversity their workforce and individuals looking for the right job fit. 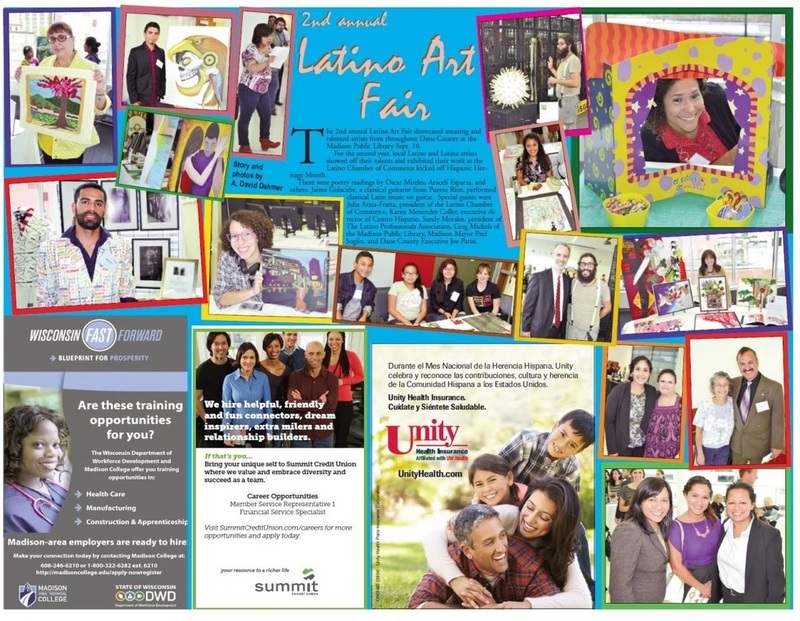 While the Job/Career Fair will certainly have a Latino theme to it, all are welcome and encouraged to participate. As the national economy and Dane County have rebounded from the recession, Parisi said some may still feel left behind economically and the Centro Hispano fair may open some doors. Despite the inexcusable failure of our elected leaders in Washington to reform America’s outdated and ineffective immigration laws, more and more Hispanics are moving, living and working here. And that makes local efforts to help assimilate these immigrants even more important, especially making connections between willing workers and needy employers. This Saturday’s Latino Job Fair is a great example of the partnerships needed to create the kind of inclusive community Dane County needs to be to be successful. Billed a family-friendly, festive job fair, Centro Hispano is partnering with UW Hospitals, Edgewood College, Epic and more than 40 other area employers looking to diversify their workforce and promote employment and career opportunities. It’s from 10 a.m. to 3 p.m. at Centro Hispano on Badger Road, and while it will certainly have a strong Latino feel to it, organizers are welcoming anyone to participate. Frankly we welcome the Latino feel, and appreciate the partnership building the Dane County community of the future. Latinos are the fastest growing ethnic group in Dane County, and the nonprofit social service agency Centro Hispano has been working for three decades to assist Latino families and build community. Latino workers in Dane County often find themselves in low-paying jobs as they raise their families, leading to disparities in quality of life compared to white non-Latinos, says Karen Menendez Coller, executive director of Centro Hispano of Dane County. “Disparity is something our families have been living with for some time now,” Menendez Coller said. And as the Race to Equity report and Rev. Alex Gee’s Justified Anger Coalition are calling the community together to address disparities in the quality of life of African-Americans in Dane County, Menendez Coller wants to bring attention and resources to the disparities confronting Latinos. She and the agency’s board of directors will convene a session Friday at the center to hear data about the Latino community and begin strategizing. Personal stories will be an important part of the information gathering in a series of sessions that Menendez Coller said she expects to eventually include the public. But the numbers already reveal disparities. Using Census data, HealthyDane.org puts the median annual household income of Latinos in Dane County at $39,360 for 2008-2012, compared to $27,833 for African-Americans and $66,150 for white non-Latinos. Latino children in Dane County are more than four times more likely to be living in poverty – 24.5 percent – than are white, non-Latino children, Healthy Dane reports from 2008-2012 Census data. Just under one half of African-American children in the county were then living in poverty, Census data says. “The basic programs we do at Centro are to reduce the disparities,” Menendez Coller said. She took over leadership of the center about a year ago, after moving to Madison from Los Angeles with her family. The vibrant presence of the Latino community in Dane County, Wisconsin, has been a revelation to her. “I am always really surprised when I go into schools here and they look identical to schools I saw in L.A.,” she said. The Latino community is a young community as well. It is now the fastest growing ethnic student group in the Madison School District, and Menendez Coller says the local birth rate is three times that of white non-Latinos. Menendez Coller is part of the Justified Anger Coalition, and says she fully supports those efforts to assist African-Americans. But she is eager to widen the focus to include the Latino community. “Our programs are essential now to ensuring the success of adults and children as they transition to live in this new country,” she said. Madison has a lot of great community members. But Gloria Reyes is truly a community member. Reyes is a true product of the Madison community where she was once boosted by a Centro Hispano scholarship. Today, she is adamant about giving back and helping boost other young people’s hopes and dreams through her role as president of the board of directors for Centro Hispano of Dane County. And as a long-time South Madison neighborhood police officer and City of Madison police detective, Reyes uses trust-based policing and a foundation of solid relationships to do her work in the community. 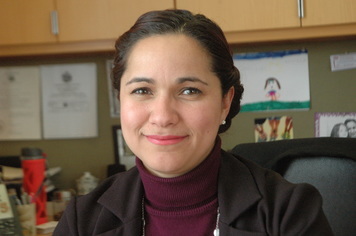 Since the beginning of 2013, Reyes has been assigned to the Special Investigations Unit where she employs a new way of policing using focused deterrence that identify violent offenders in our city and notifies them that they need to stop their behavior; otherwise the police department will utilize all of its resources to prosecute them to the full extent. At the same time, Reyes also works with a community- against-violence team that offers resources that help people find employment, education, and housing to help ex-offenders integrate themselves back into our community. On top of this, Reyes is the president of the Dane County Chapter of Latino Peace Officers Association and one of the founders of Amigos en Azul (Friends in Blue), a diverse group of officers dedicated to building trust and breaking down barriers between the police department and the Latino community and beyond. The Madison Times caught up with the busy Gloria Reyes recently and she kindly answered some questions. Gloria Reyes: I have always wanted to become a detective. As long as I can remember it was my dream and passion to work in law enforcement. However, I wasted many years listening to people who told me that I wasn’t strong enough or who told me I was too little or not smart enough. You didn’t see many Latinas in law enforcement, so I believed for many years that maybe they were right. There were many people and situations that paved the way helpng me achieve my dreams. You will always have people who tell you that you can’t do something but you need to listen to those who will help you and support you. That is something I tell to every young person I come in contact with. I am one of those kids who oftentimes sat in the back of the classroom with no support. I remember I couldn’t see the blackboard because my parents couldn’t afford to buy me glasses, so it was so much easier to sit in the back of the room and hide rather than tell people that we were too poor. It is so much easier for teachers to pay attention to the students who are excelling and doing well, but it was challenging to find those teachers who really wanted to help me. Don’t get me wrong … there were a few teachers who stepped out to help me through the years and those are the ones that I remember the most and are responsible for my success today. I want teachers in our community to take that extra time for that student sitting in the back of the room who is struggling because you never know who that student will become someday. That student was me. I have come a long way and I would never have imagined that I would be in this position now and I’m confident in my abilities that I can move forward and do so much more. TMT: As a neighborhood police officer on the city’s south side and as a detective now you have demonstrated the value of community-based policing and building relationships. Why is that so important in police work? GR: A few years ago, [former Madison Police] Chief [Noble] Wray stressed to me the the importance of building relationships and trust within the community before there was a crisis. I have remembered this and followed his advice throughout my career. I first studied community policing in a class taught by Professor Herman Goldstein and I remember thinking to myself that this is the kind of policing that I believe in. We realize that solving crime and keeping our community safe goes well beyond what we can do as law enforcement and that it takes a collective effort that includes our stakeholders, residents, and our entire community to find solutions for the issues that face our community. Some of the most successful initiatives that I have been a part of was when we have our community partners at the table working to solve our community challenges. As a neighborhood officer, I was able to meet and work with residents on the south side of Madison. This was my favorite position and important work was done there. I often come in contact with people again during an investigation or normal course of business. I find that it is much easier in seeking cooperation or assistance when you have built trust and relationships with members of our community. We have our educational resource officers, community policing teams, and safety education officers who share the same experiences and play a important role in community policing. I feel very fortunate to work amongst great officers who truly believe in community policing and they show this every day when serving our residents in the City of Madison. TMT: You are the president of the Dane County Chapter of the Latino Peace Officers Association and one of the founder of Amigos en Azul (Friends in Blue). GR: The Latino Peace Officers Association-Dane County Chapter was started a couple of years ago in the attempt to bring together a group of officers who promote equality and professionalism in law enforcement. The objectives of the organization are to create a fraternal/professional association that provides its members and members of the community with career training, conferences, and workshops to promote education and career advancement, mentoring, and a strong commitment to community service. We have seen an increase in Latino police officers in Dane County and this is a great opportunity to connect with each other and serve as support for each other. We are still a new association but we hope to raise funds for scholarships for students who are interested in a career in law enforcement. Amigos en Azul is composed of officers dedicated to dissolving cultural barriers and building trust between the City of Madison Police Department and the Latino community. We started this group in 2004 and it has expanded to include other law enforcement jurisdictions like UW Police, Fitchburg Police, and Sun Prairie Police Department who have become partners. We have come a long way in building trust and relationships with our Latino community through programs such as Spanish crimestoppers and Latino Youth Academy. TMT: How does it feel to be president of the board of directors at Centro Hispano after being a former Centro Hispano scholarship winner back in the day? GR: I clearly remember the night that I was an honoree receiving the Centro Hispano Scholarship Award. To me, it was much more than the financial assistance that it provided, it was being recognized by my community, business leaders, and family. It was a symbol to me that I can accomplish my dream. I made a promise to myself that when I reach my dream that I would come back and give back to the community that once helped me. 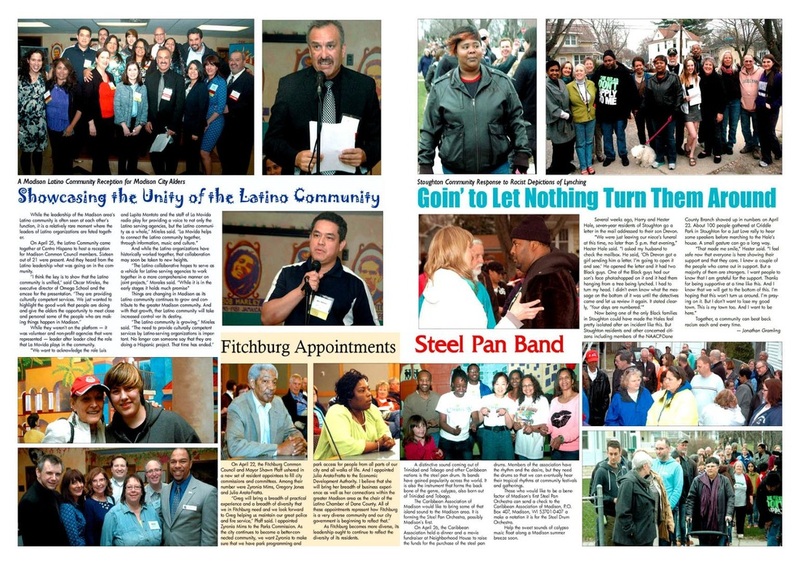 Centro Hispano has been my focus and it has been my support over the years and continues to be. Each time I walk into Centro, it feels like home to me. I feel like I belong to something so much bigger then me — I belong to my community. If it were not for Centro Hispano, I would not be where I am today. Sure, I did all the hard work, but Centro began with the support of how to achieve my dream. Our families oftentimes understand the importance of an education, however, we do not understand the system’s practices and the road that will help us succeed. Centro Hispano has done that for me. 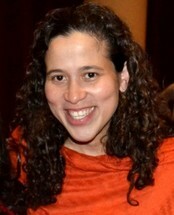 TMT: Last August, Centro announced that Karen Menendez Coller would be the 8th executive director of the organization. Talk to us about why the board of directors chose her. GR: I recall the interview with Karen and she knocked me out of my seat. Anyone who has listened to her talk about her experience and her vision can see her passion and dedication. Her research background really stuck out the most for me as we want to be able to look at the numbers we need to know as we serve an ever-growing Latino community. Karen is focused on making our families stronger and building partnerships with existing organizations and leaders to make Centro as strong as it can possibly be. I also would like to commend our board of directors who worked very hard through the search, selection, and transition process. I feel honored serving on this board with such dedicated professionals who are just as passionate as I am in serving our community and always consider how our decisions will effect Centro Hispano and the greater community. TMT: How has her performance been so far? GR: Karen has transitioned well into this community and she is fostering positive relationships with our community leaders and businesses. Most importantly, she is preparing and leading our staff to help them move Centro Hispano to the next level. TMT: What can we look for from Centro Hispano in the future? GR: Centro Hispano will take the lead in fulfilling the needs of our community. We aim to be a place where families and our youth are welcomed. We dream of a computer lab available for students and parents, conference rooms for our leaders to meet, and a room full of books. Centro Hispano will continue to be a place where you feel a part of a community, a place where leaders are made, a place where partnerships are developed, and a place where we make dreams happen. Karen Menendez Coller’s academic passion kicked in as a high school student, propelling her eventually to a doctoral degree in public health from Johns Hopkins University in Baltimore. It was all a part of having arrived in Los Angeles at age 14, a member of an immigrant family from war-torn El Salvador. Stories of immigrant families are powerful and need to be shared, she said, something she hopes to encourage in her new position. 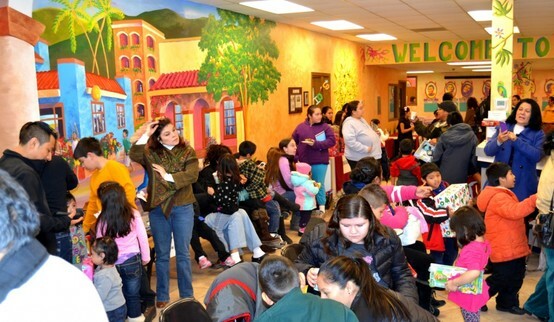 Centro Hispano, 810 W. Badger Road, is a nonprofit organization that provides social services, job training, educational opportunities and a cultural home to Latinos and other immigrant populations. Coller, who began Aug. 26, is the eighth executive director in the agency’s 30-year history. She succeeds Kent Craig, who left earlier this year to return to school after more than two years leading the organization. Coller, most recently a faculty member at UCLA, already was planning to move to Madison from L.A. when she learned of the opening at Centro Hispano. Her husband — Dr. Ryan Coller, a pediatrician and Green Bay native — had taken a position at American Family Children’s Hospital. Coller herself was preparing to accept a job offer in public health at UW Hospital, she said. The Centro Hispano job tugged at her because of the potential to quickly and positively affect people’s lives, she said. 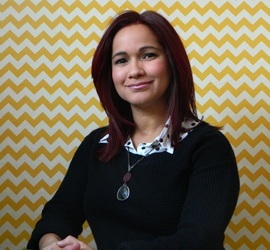 She had spent years leading research projects and developing programs addressing things such as unintended pregnancy in the Latino community and teen mental health problems. It was satisfying and important work, she said, but the slow pace of academia sometimes wore on her. “I wasn’t seeing the impact right away, and it was kind of frustrating,” she said. Gloria Reyes, a Madison police detective and president of the Centro Hispano board, said Coller impressed the hiring committee with the depth of her knowledge of Latino issues. “Now she’ll be bringing what she learned from her research and turning it into reality,” Reyes said. One immediate goal for Coller is to strengthen current programs by reducing staff turnover, she said. The agency has an annual budget of $1.4 million and employs 19 people, 15 of them full time. Longer term, Coller hopes to increase partnerships with other community groups and do more outreach to newly arrived immigrants. “I’d like families to come here when they first arrive so that we can help stabilize them right away, instead of waiting for a crisis,” she said. That approach — building strong relationships prior to an emergency — already works well with Centro’s youth programs, Coller said. Coller’s family immigrated to the U.S. legally at a time when El Salvador was in the midst of a brutal civil war. Her father, an attorney, had difficulty finding work here and returned to El Salvador for several years while the rest of the family stayed in L.A., a heart-wrenching but familiar sacrifice to many immigrant families, Coller said. Yet because of California’s large immigrant population, Coller said the adjustment for her was not difficult. She earned a bachelor’s degree in cell biology at the University of California, Berkeley, then spent a year in Zambia at an HIV counseling and testing site. She returned to the U.S. to earn a master’s degree at the University of Michigan and a Ph.D. at Johns Hopkins, both in public health. She met her husband while at Johns Hopkins. They live in Middleton and have one daughter, Olivia, almost 2. Most recently, while on the faculty at UCLA, Coller studied high-achieving schools in L.A. to better understand the environments that lead Latino youths to make good life choices. She already met with Jennifer Cheatham, Madison’s new schools superintendent, to discuss how Centro Hispano’s programs fit with Cheatham’s strategic plan.